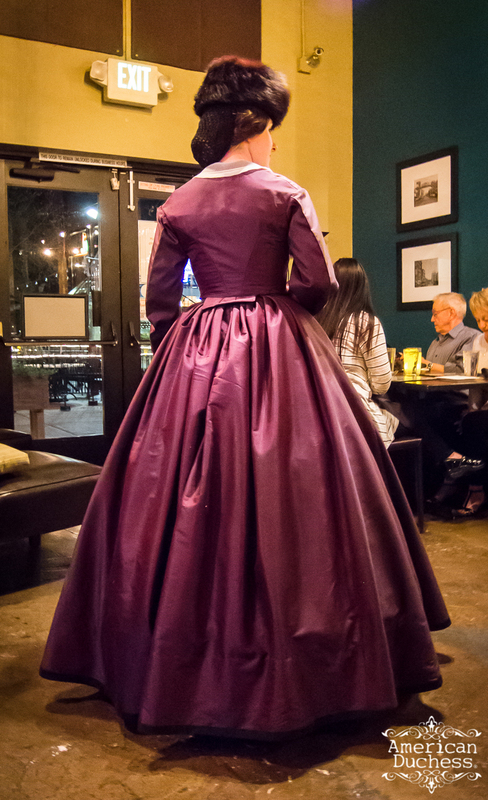 This past Tuesday I was in a mad rush to finish the day version of my 1860s purple gown, just in time for the tree lighting ceremony downtown. This was about 2:00 pm on Tuesday ... the event started at 4:30! I was stitching right up to the last minute, but I wanted to do things right. That's always a tedious combination when you're trying new techniques for the first time! 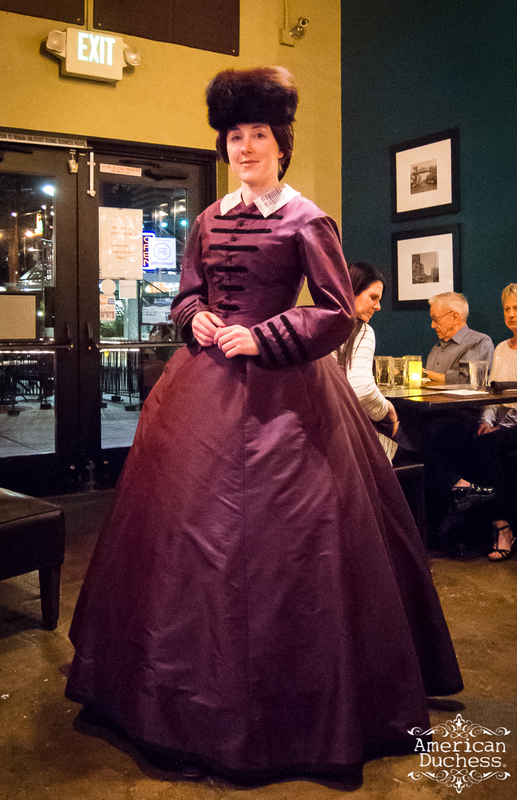 I got my purple silk in China, and bought 7 yards of it, which turned out to be too little for a day bodice, evening bodice, and the enormous, tightly-pleated, bell-shaped skirt of the first half of the 1860s. 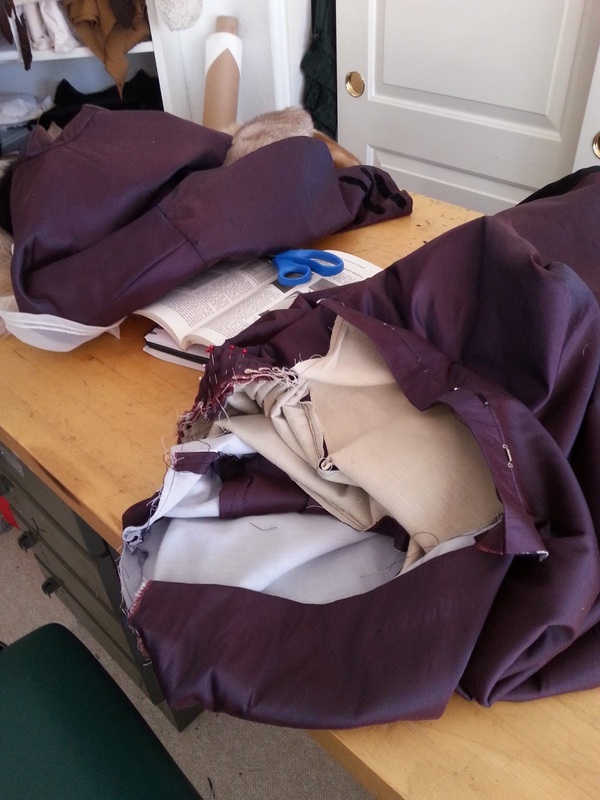 I had only 132" hem with the rectangular panels...uh oh. I quickly opened Period Costume for Stage & Screen: Patterns for Women's Dress, 1800-1909 to see about gored skirt patterns. Hunnisett notes several with varying numbers of panels and layouts for each. 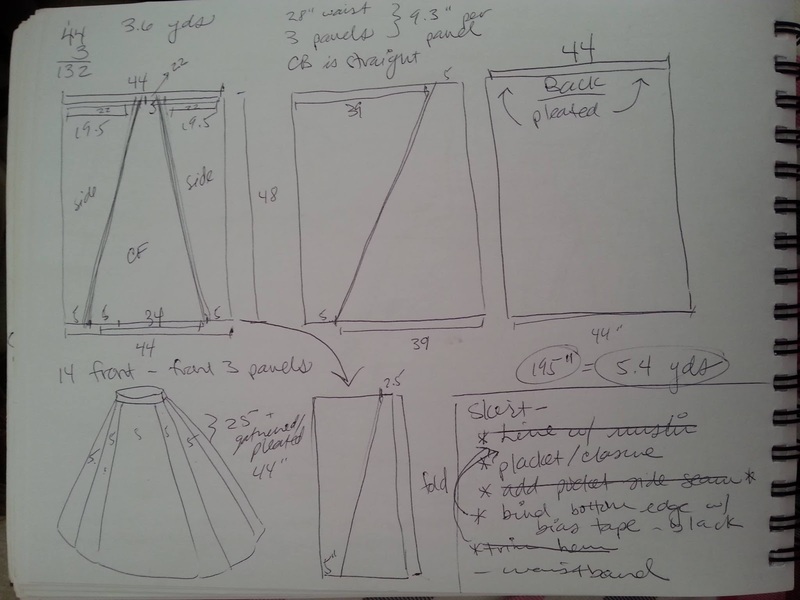 Encouraged, I scribbled out a plan to achieve the right waist measurement and increase the hem circumference as much as possible. Success! From three rectangular panels, I squeeked out a 195" hem! MAGIC! Of course, this added complexity where I didn't expect. My ginormous crinoline+petticoats now was too big and bell-shaped. I removed one of the petticoats and switched one of the bum rolls holding the hoop back in a more elliptical shape, but after wearing this ensemble the first time, I can see I need an even flatter front, and smaller diameter cage underneath, and a full-length, flounced petticoat. However, this is what it's all about, right? Learning by doing! I'm very happy with this first wear, with plans to fiddle and fuss...when I don't have a killer deadline! My pics from the evening aren't that great, but I promise to get out (probably in the snow) to take some proper photos soon. I quite like the back - next time I'll let the back of the skirt drag just a bit, and also a flounced petticoat will help hold the skirt out. 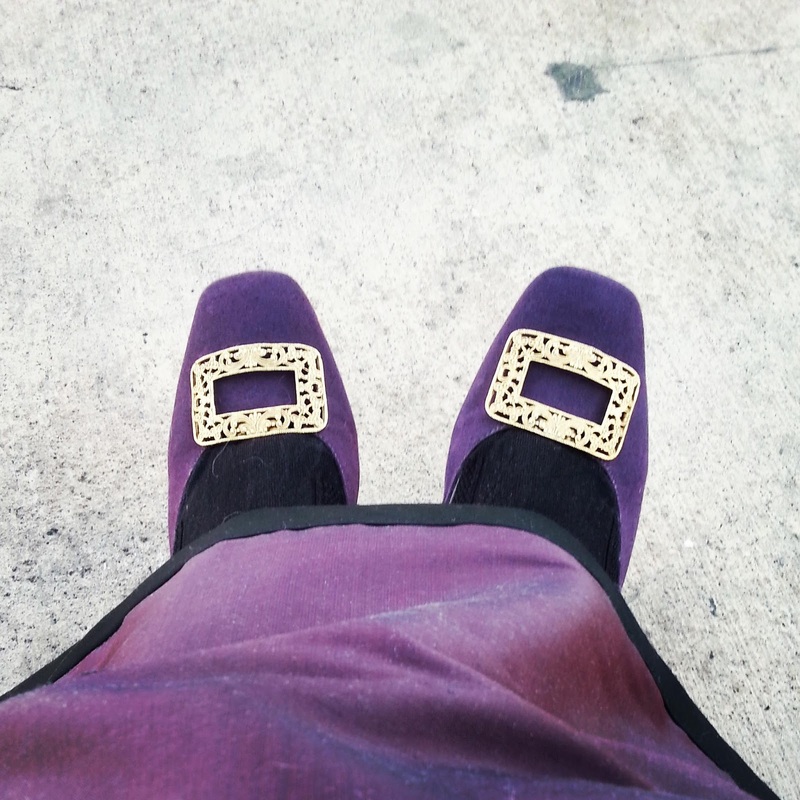 I wore a pair of "Tissot" Civil War Slippers dyed purple to match my dress. Tissots look ace with shoe clips, but I didn't have time to make any ribbony puffs, so I clipped on some vintage "Cromwell" style buckles, to add just enough interest. Now to the ballgown bodice for next weekend...! Your dress is gorgeous!! I can relate to the fabric shortage - I only had 6 yards of my 1860s fabric but ended up finding more online, thankfully. It's delicious! And isn't it nice to know that the math they made us do at school has a genuinely practical application in sewing! Wow, just found your blog and these dresses are amazing! How do you do it?! And what do you do with the clothes when you're done with your events? Do you just have closets and closets full of petticoats, stays, dresses and whatnot? And speaking of events, what kinda conventions do you use these for? Sorry for all the questions, but I'm dying to know. Hi Mikaela - thanks for following me! I actually wear the costumes I make quite a lot, to various events, fairs, dances, parties, and conventions. The main convention I go to is Costume College, each August in L.A. I don't have all that many costumes - lots of pieces mix and match, and I usually wear the same petticoats for a bunch of different periods. Sometimes I'll sell my old costumes, or cut them up to refashion them into new costumes. Will you be wearing it to the Great Dickens Christmas Fair in San Francisco? It would be perfect and the pictures would look fabulous. I might be coming to Dickens in a couple weekends - it depends on the weather.